Mike Yang/Staff Photographer Volunteers clean up garden beds in the Fine Arts Memorial Courtyard on Friday as part of the Global Day of Service. As part of the Global Day of Service, students, alumni, staff and residents of the Binghamton community demonstrated the collective power of volunteerism in more than 70 projects in three countries. The projects, hosted by alumni site leaders, had over 700 preregistered volunteers in Malaysia, Taiwan and the United States. 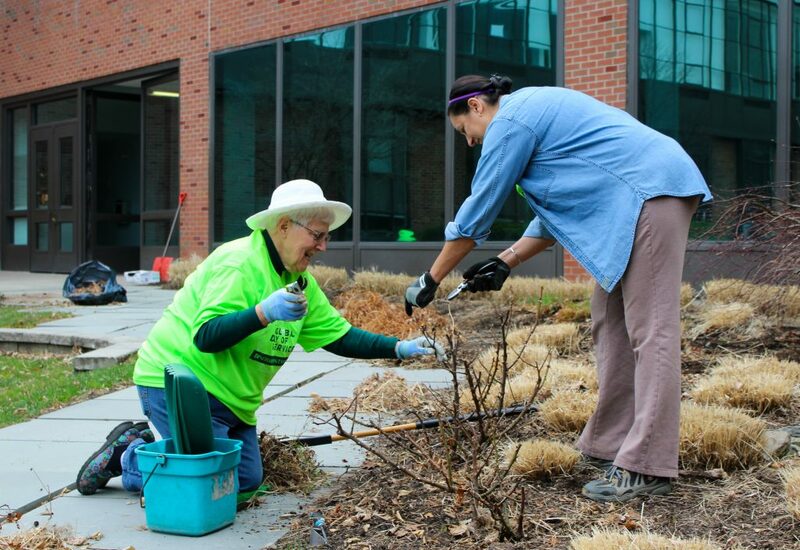 The Global Day of Service, which is celebrating its fifth anniversary at Binghamton University, has hosted more than 200 projects since its inception. Alicia Hibbard, senior coordinator of alumni volunteer engagement and the main staff lead of the projects, wrote in an email that the project was created in 2015 to foster connections between communities and University members. In Binghamton, nine service projects ranged from gardening and yard maintenance to painting and rehabilitating an animal shelter. According to Hibbard, organizers avoided creating a central theme for the event so alumni could pursue their own ideas. Kaitlin Maynard, ‘12, administrative assistant for Harpur College, was a co-host of the “Cleanup & Cattercise” event at Every Dog’s Dream Rescue Inc. in Johnson City, where volunteers helped clean the facility and build new perches in a room for kittens. In an email, she wrote that the event gives students an invaluable opportunity to connect with alumni and community members and to learn from their experiences. “Sometimes when you’re in school you feel like you need to do everything just right, in a particular way, and it’s helpful for students to see that there are so many different paths to take in life, and they don’t always lead where you think they do,” Maynard wrote. Amelia LoDolce, ‘02, organized the “Binghamton Urban Farm Workday,” where participants created new garden beds at a site in Binghamton, worked with compost from the community and planted perennial crops. LoDolce, executive director of Volunteers Improving Neighborhood Environments (VINES), said the day of service was crucial in developing the Tudor Street community garden. Because of extensive flooding of the Susquehanna River in 2006 and 2011, the city of Binghamton worked with the Federal Emergency Management Agency (FEMA) to offer buyouts of damaged properties. Owners had the opportunity to sell their homes at market rates and have assistance to move elsewhere. According to LoDolce, eight homeowners near the river took that option to avoid future flooding and investments to continue repairing the properties. The land obtained is now becoming growing space for VINES. The garden, which was previously less than half an acre, has expanded to over two acres. Volunteers with VINES plan to sell the produce at reasonable rates as part of their VINES Farm Share, which includes a weekly subscription and delivery of a box of locally grown veggies to members. Abigail Katz, a senior double-majoring in psychology and economics, said students should try to go beyond BU’s campus and out into the community. Site leaders encouraged students to participate in volunteer work beyond the Global Day of Service to foster relationships with those in the community and to see everything Binghamton has to offer. Correction: A previous version of this article stated that Abigail Katz is a senior double-majoring in environmental studies and economics. She is a senior double-majoring in psychology and economics. Pipe Dream regrets the error.